Dawn mantras (2008) for vocal ensemble Ross Edwards The Song Company, Roland Peelman 6 mins, 50 sec. Southern Cross chants (2004) for 6 or more voices Ross Edwards The Song Company, Roland Peelman 22 mins, 31 sec. Past life melodies (1991) for vocal ensemble Sarah Hopkins The Song Company, William Barton, Roland Peelman 7 mins, 45 sec. Pirrki-pirrki (2009) bloodwood Rosalind Page The Song Company, Roland Peelman 7 mins, 17 sec. Out there (2008) for vocal ensemble Dan Walker The Song Company, Roland Peelman 2 mins, 36 sec. Also includes: Eclipse / William Barton -- Apollinis eclipsatur / Bernard de Cluny -- Conditor alme siderum / Dufay -- Milthi / William Barton -- Kurrartapu (magpie) -- Kuritjitjin (magpie-lark) -- Matjumpa (kangaroo) -- Kalkadunga yurdu / William Barton -- Milthi milthi (Seeds) -- Kalkadunga yurdu / William Barton -- Matilda (based on traditional 'Waltzing Matilda') / Ruth McCall. 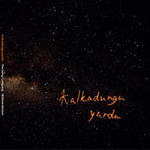 Kalkadunga Yurdu includes a booklet, a CD and a DVD insert of The Song Company's 'Kalkadunga Man' concert, featuring William Barton on didjeridu. The stunning images of the Kalkadunga region around Mount Isa in central north Queensland have been taken by photographer Allan Chawner. Score: Dawn mantras / Ross Edwards. Score: Past life melodies : for orchestra (& optional choir) / Sarah Hopkins. Score: Past life melodies : for 12 celli / Sarah Hopkins. Score: Past life melodies : for treble voice choir and 4 celli (optional) / Sarah Hopkins.